Cat toys come as variable as cats themselves, which can make it a little overwhelming when looking for the perfect piece of furniture that will keep them entertained, healthy, and look good in your home at the same time. One of the most important things you can provide for your cat is a scratching post. As a key item for the home, it will keep your precious furniture safe from being shred to bits, help your kitties keep their claws healthy, and provide plenty of exercise for their whole body. It is important, however, to be discerning in your choice of scratching post. If you don’t do your research, you may end up with something cheap and badly made. As well as the danger this presents a cat, some scratching posts can contain harmful chemicals, or be full of non-sustainable material. 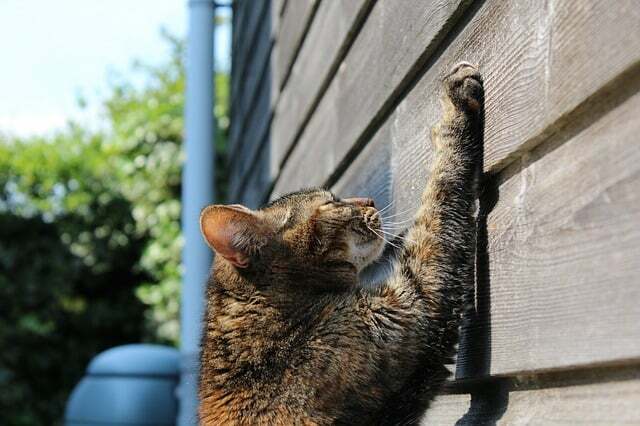 This article will cover various types of scratching posts, as well as discuss one option you may not have considered: sustainable scratching posts. More specifically, we will discuss the best eco-friendly cat scratching posts around. Scratching posts are great for cats for a number of reasons. 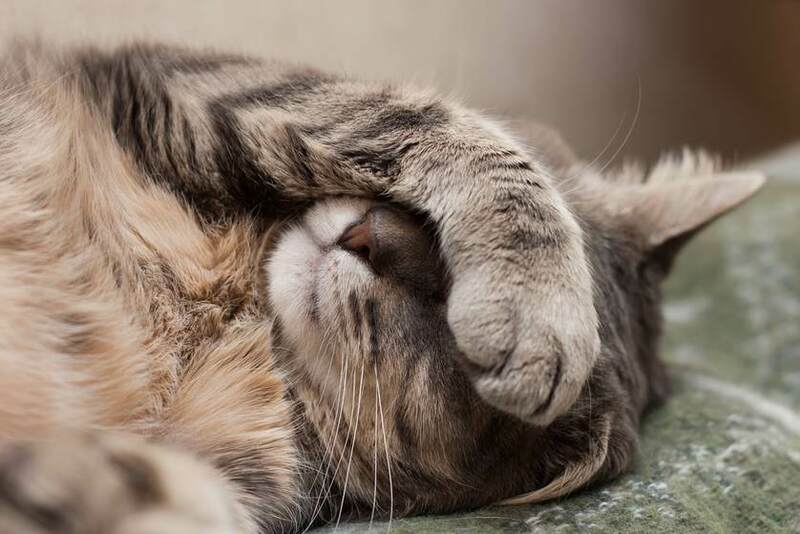 Beyond the physical benefits they provide, they also give cats a way of working out stress and signaling their body language to you or to other cats. They can be elaborate structures or very simple. Some are in the shape of entire “tree” structures or come just a single post. Homemade examples are grand, architectural marvels that hug the contours of a wall, or are made to create an exercise ‘run’ for indoor or outdoor spaces. Their materials differ significantly but range from simple cardboard right up to the artificial hemp-like sisal. Put simply; cat scratching posts are usually a post (made of wood, typically) around which is wrapped a rough material that will create resistance for the cat’s claws as they try to scratch it. Sometimes they come with a platform (or two on a multi-layered one) that offers the cats the opportunity to climb, or to sit higher up from the ground and feel secure. Encourage and praise your kitty when they scratch in the right locations! It is entirely possible to train a cat to use the correct items. 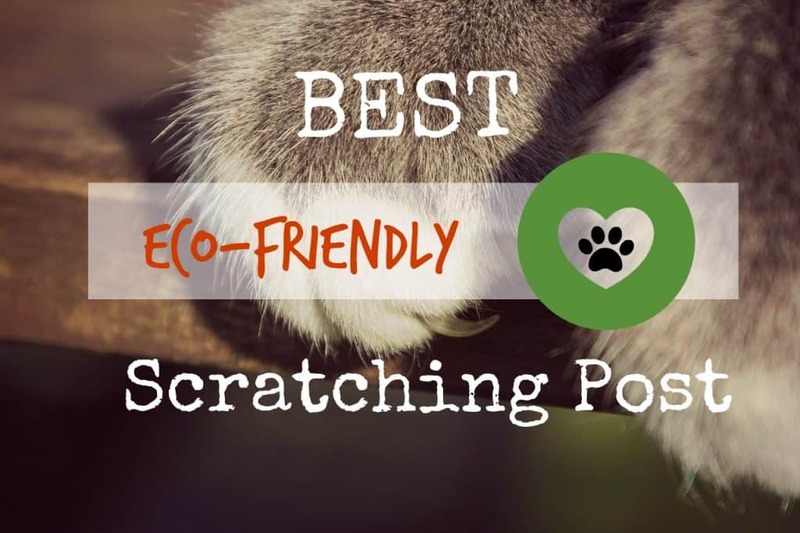 By providing them with a piece to scratch, whether a standard or an eco-friendly cat scratching post (or sometimes two) you can direct their behavior very effectively. Cheaper scratching posts suffer from numerous problems. Often severely centered and not heavy enough, they provide a hazard for a large cat who might put too much weight on it, or indeed a problem for smaller cats who risk being crushed by them. Instead of more natural materials like real wood, cheaper cat scratching posts are not very eco-friendly. In the mass-manufacturing process, these posts often consist of unsustainable materials such as plastic or toxic woods. When you buy a cheap scratching post, you run the risk of buying something that is not only damaging to the environment but could be hazardous to your cat. Worst of all, they are rarely recyclable. Lots of people throw away cheap scratching posts at the end of their life-span. Eco-friendly cat scratching posts provide a sustainable, good-quality, environmental option that enhances the health of your cat. It need not be an elaborate, nor prohibitively expensive item, but does require a little forethought. Some cat owners with a bit of know-how have gone out of their way to create their own , such as ‘mountain cat trees’ – which are made from reclaimed branches, carefully weighted, with the addition of platforms for vantage points. But you don’t need to be a DIY expert to get the best eco-cat scratching posts! There are plenty of options out on the market as long you know what to look for. 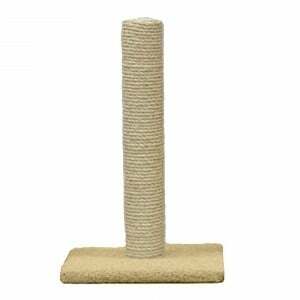 The best eco-friendly cat scratching posts are the ones that are made of organic material. By this, we mean something that is biodegradable and doesn’t harm the environment to produce. Sisal, a natural material, is a good example of this. It also provides a higher quality scratching surface, as it tends to be rougher than a lot of non-environmental options. Some scratching post manufacturers go out of their way to install organic wool on the bases as well. This is another natural component that is guilt-free. Untreated wood, though sometimes less sustainable, is a less chemical, less noxious alternative to plastic. Oftentimes, the best eco-friendly cat scratching posts are ones with recyclable materials. A lot of companies specialize in finding strong materials like aluminum plates which can form the base of the post. Some may use recycled wood or cardboard, which in turn can be recycled, to form the post itself. Discover our selections for the best eco-friendly cat scratching posts in both vertical and horizontal formats. 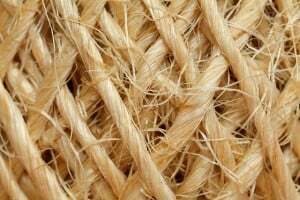 As previously discussed, sisal is a fantastic eco-friendly material that is biodegradable, looks great, and is highly durable. 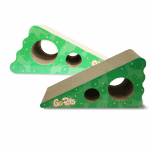 Cardboard provides a fantastic foundation for any eco-friendly cat scratching post. Even though it lacks the durability of more traditional materials (including nasty plastic), it’s possible to dispose of it in an environmentally-friendly way. The 4CLAWS Wall Scratching Post, and others like it, take advantage of its convenient vertical nature to maximize your cat’s need to stretch. Other contraptions, like the PetFusion Ultimate Cat Scratcher Lounge, are (mostly) flat surfaces made from only recycled cardboard. This takes into account the best angles for a cat to scratch horizontally. 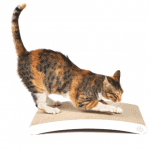 Our preference goes to PetFusion’s insanely popular cat scratcher lounge, a slightly curved scratching post with a simple design that makes all the difference. Here again, this scratching post contains recycled cardboard and is of course 100% recyclable. The design is a bit more colorful which might not accommodate every home, but it’s nonetheless a very efficient eco-friendly product. We hope you were able to select the best eco-friendly cat scratching post for your fluffy feline! A cat scratching post is an absolute necessity in your home if you want to keep your cat healthy. It is more conscientious to buy a sustainable option. Thanks, great post. Almost all the cat scratching posts I have seen where made of Sisal, but of all cats who have ever resided in my home there was only one who actually used its post. Fozzie my latest cat does not use his. Instead he scratches one of my kitchen chairs horizontally and a big suitcase that I no longer use horizontally. I wouldn’t term them ecological, but at least “recycled” by the cat. The most popular scratching post of Fozzie and neighborhood feral cats is one of the palm trees in the garden. It does give them incentive that some doves reside on the top of said trees. You mentioned something about body language of cats and scratching. Could you say more about that topic?